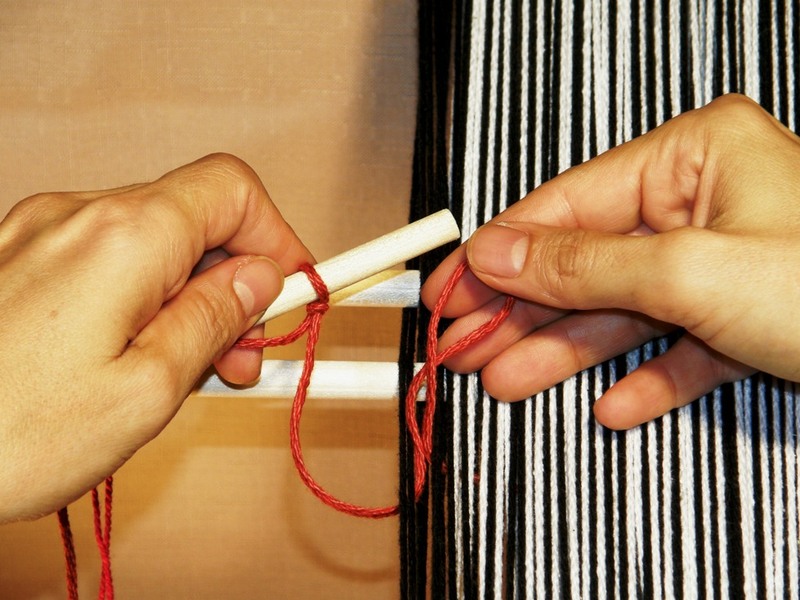 Here are step-by-step photos for making continuous string heddles. The kind of thread I use for the heddles depends on the kind of warp yarn I am using. When using medium to heavy-weight mercerized cotton, I generally use the warp yarn as the material for the string heddles. If I am using fine, unmercerized or softly spun cotton, silk or wool, I might choose to use a tightly twisted crochet cotton or even tatting thread depending on the size of the yarn. I try to match the size of the heddle material to the size of the yarn. A lot of my indigenous weaving teachers use nylon thread or cord for their heddles as it is less abrasive on the warp. I dislike using nylon but you should experiment and find out for yourself which kind of heddle string you prefer. In this tutorial, my warp thread is a fairly heavy -weight mercerized cotton and I am using that same material for the heddle string. I wound a warp for double weave for this demonstration which means that each heddle will be holding a pair of warps. Normally each heddle controls a single warp. 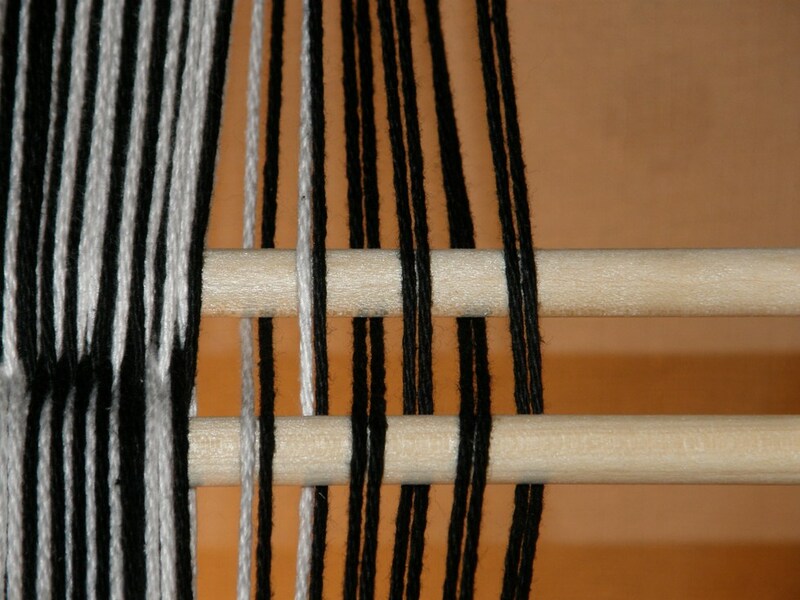 Whether you are using doubled or single warps the method for making the heddles does not change. A video of the process can be seen at the end of this series of step-by-step photos. For double weave, your cross will look like this. Remember that in this technique you are using doubled warps. The all-black warps will form the black border. You have one white and one black warp in pairs in the area where you will weave your motif. 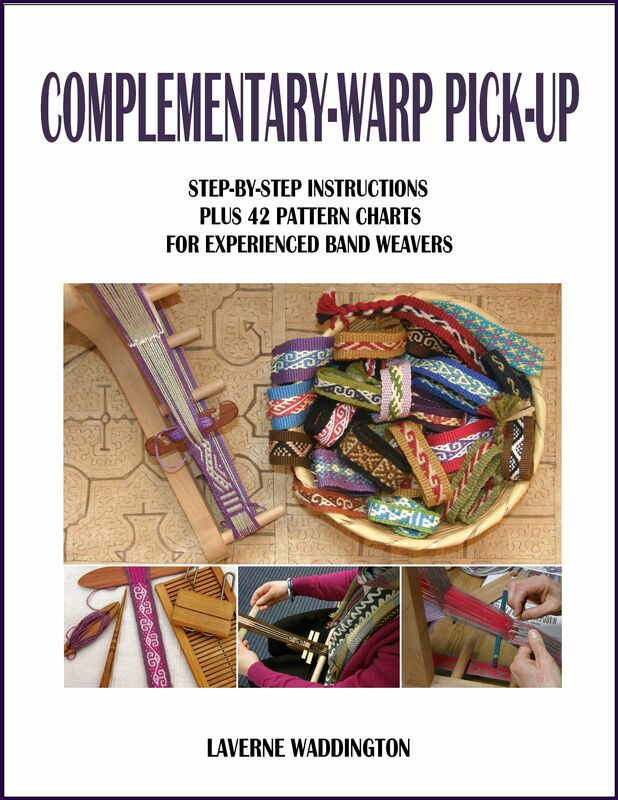 You will be putting each of the pairs of warps that are passing over stick B in a heddle. Open the shed and pass your heddle string through as shown. 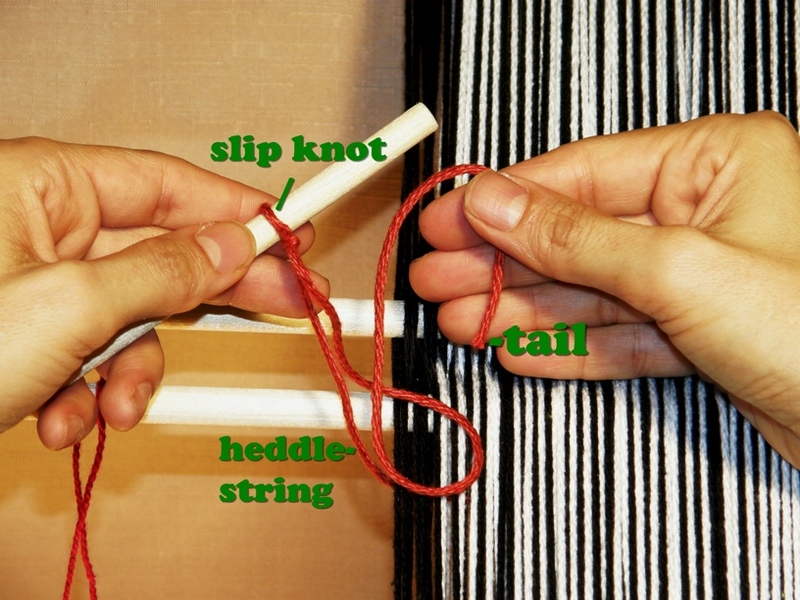 Make a slip knot in the end of the heddle string and place it on you heddle stick. Leave a long tail as shown. 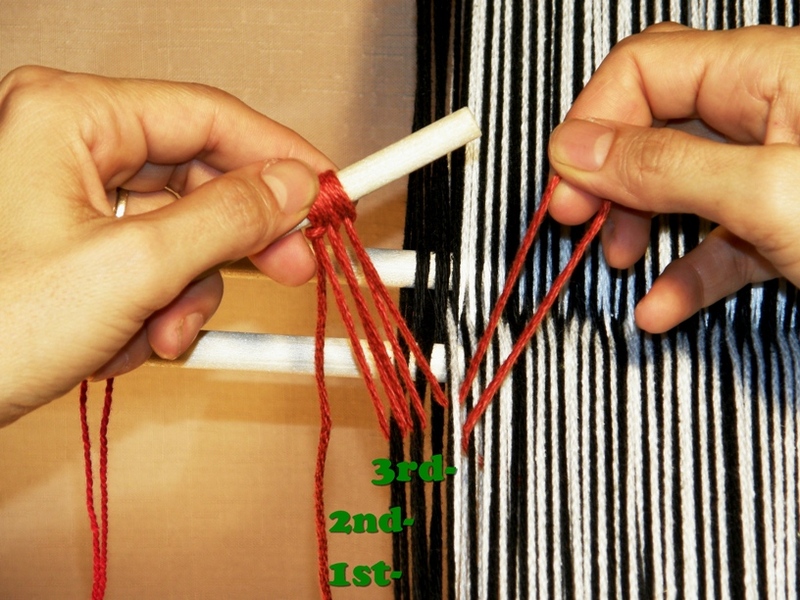 Reach down between warp pair 1 and 2 and pull up the heddle string as shown. Put a twist in the loop. Place the loop on the stick and anchor it with your left forefinger. 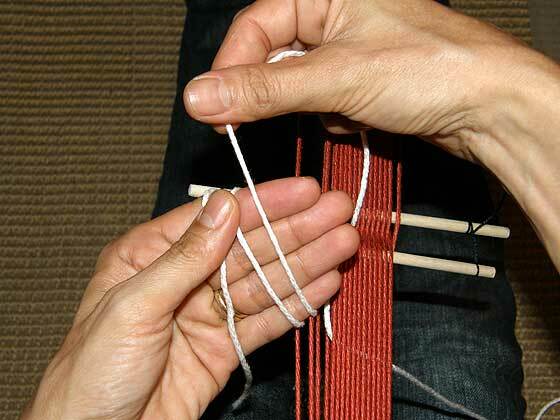 Put an extra twist in the heddle string forming a small loop. 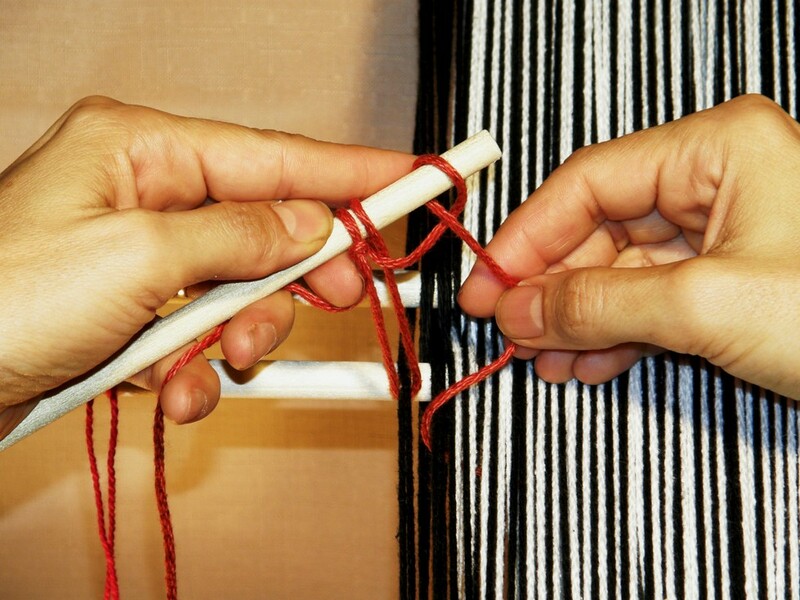 Put the small loop on the stick and tighten it by pulling on the end of the heddle string. You can now let go and see that your first warp pair is secured within its heddle. Moving on…..heddles have been made around the 1st and 2nd warp pair and the heddle string is being pulled up to make the 3rd heddle. 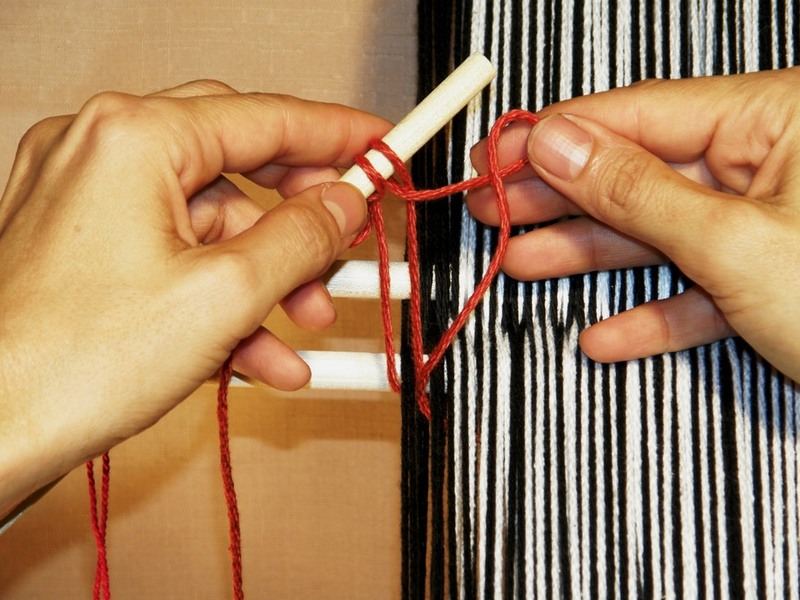 Slip the loop on the heddle stick and adjust its length by pulling on the end of the heddle string. Once you have the length correctly adjusted, anchor the loop on the stick with your left forefinger before making your extra twist to secure it. 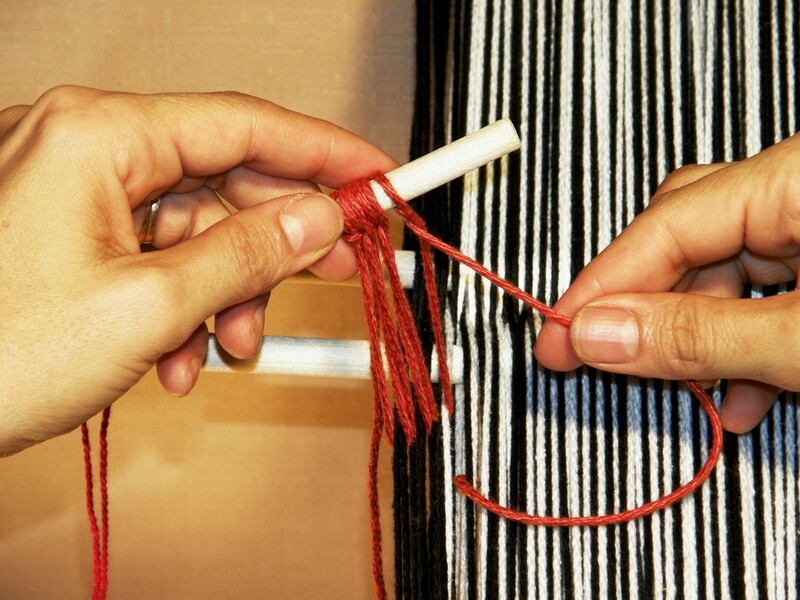 Continue like this, cut the heddle string and tie the start and end tails together. DONE! 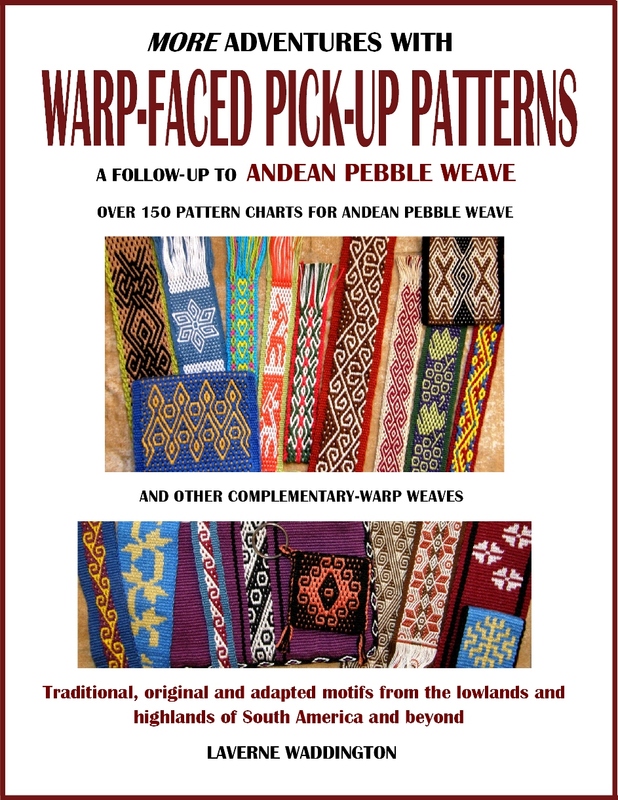 Here is a video of the process from my article Backstrap Basics on WeaveZine. Simple string heddles without a stick for narrow warps can be made following the step-by-step photos in my article Backstrap Basics on WeaveZine. 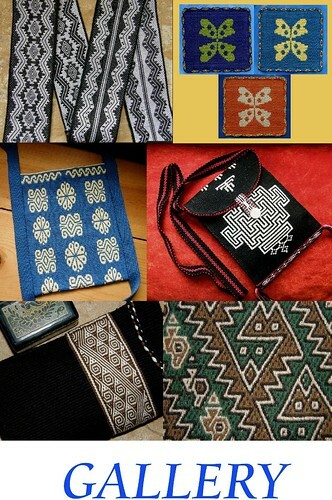 © Laverne Waddington and backstrapweaving.wordpress.com, 2009-2018. Unauthorized use and/or duplication of this material without express and written permission from this blog’s author and/or owner is strictly prohibited. 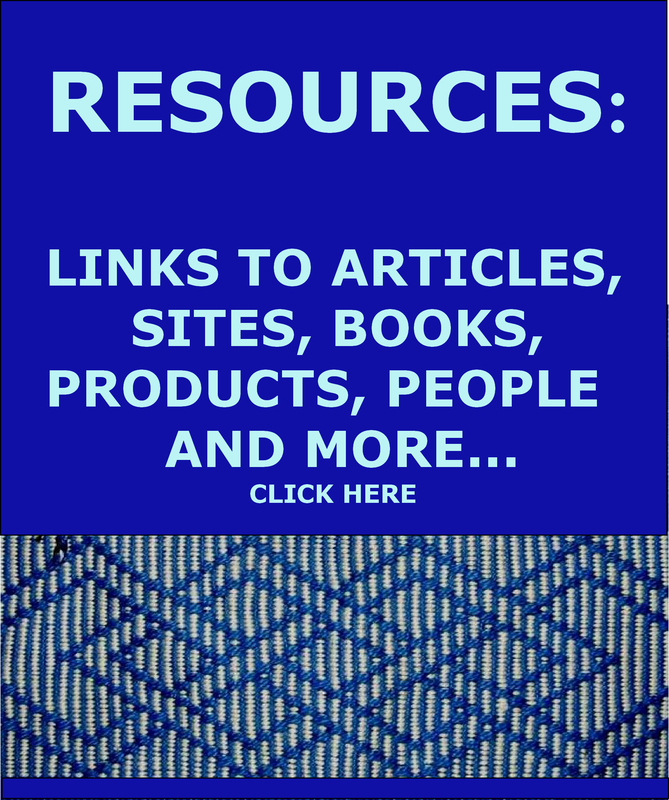 Excerpts and links may be used, provided that full and clear credit is given to Laverne Waddington and backstrapweaving.wordpress.com with appropriate and specific direction to the original content. Gracias por visitar y espero que vuelvas! The extra loop is brilliant! My navajo loom has been driving me crazy because the string heddles kept getting uneven. I had been taught to just pull the string through, twist, place it on the stick, and move on. The extra loop keeps them all locked in place beautifully. I can weave faster and much more enjoyably. I also love your site – the amazing work that can be done with such simple tools is so inspiring. I am so glad it helped. It was actually my Navajo teacher who taught that to me! Thanks for visiting. I am having an issue with string heddles, and I was hoping someone here might know how to fix it. 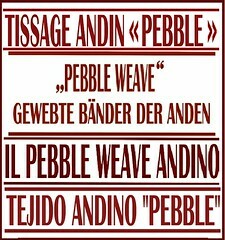 I am a new weaver, and don’t know all the correct terms. So far all I’ve done is a tabby/plain weave on an Ashford rigid heddle yarn loom, 7.5d. Using the same loom, I planned to make a twill with this yarn I fell in love with, and my weaving teacher assured me that I could do it with two harnesses. Unfortunately, I can’t figure out how to do it, and actually suspect it’s impossible without string heddles. I ended up making four continuous string heddles (after reading this post) per the pattern, and unfortunately, the farther the heddle is from the weaving, the more it pulls up the heddles in front of it. Pulling up heddle #4 was also pulling up heddles #3, #2, and #1. I consulted a couple of people and decided that the problem was that the string heddles needed to be longer the nearer they were to the weaving, so that when pulling up heddle #4, the strings would be long enough on #3, #2, and #1 that the rods they were attached to would be pulled up by the threads from heddle #4, but the strings would remain loose. However, I just made individual string loop heddles for all of them (1.5″ long for heddle #4, 3″ for #3, 4.5″ for #2, and 6″ for #1), but while it worked when I only had a few threaded up for each rod, it completely failed to solve the problem when I had them all on the rods. Unfortunately I only have the loom (borrowed) for a short time, so I may not be able to use suggestions that are late in coming. In about 3 days, I will likely resort to re-warping it for a tabby weave, and if I’m ambitious, using a pick-up stick to do a couple of small sections of twill. I’m rather hoping to avoid that, though, so if anyone has any suggestions, I’d really appreciate the help! Hi. I am sorry to hear you have been experiencing these problems on your rigid heddle loom and I hope that something I say here will help you solve the problem and enable you to finish your project. I typically work on a backstrap loom, a set-up that allows me to move my body and adjust tension on the warp…something which makes working with multiple sets of heddles easier particularly when one is weaving warp-faced cloth where the warp threads are sitting right next to each other. I have, however, woven a few balanced weave projects using multiple heddles…the kinds of structures that people often weave on their floor and table looms. I wove a rosepath pattern and a 4-shaft shadow weave and some other things. I think the secret lies in having a lot of space between your heddles. If, for example, you are raising heddle 4…the one furthest from the fell…I would bunch heddles 1, 2 and 3 very close together and then have a considerable gap between them and heddle 4. I would pull up on heddle 4 and place a weaving sword or even a wooden ruler into the shed. 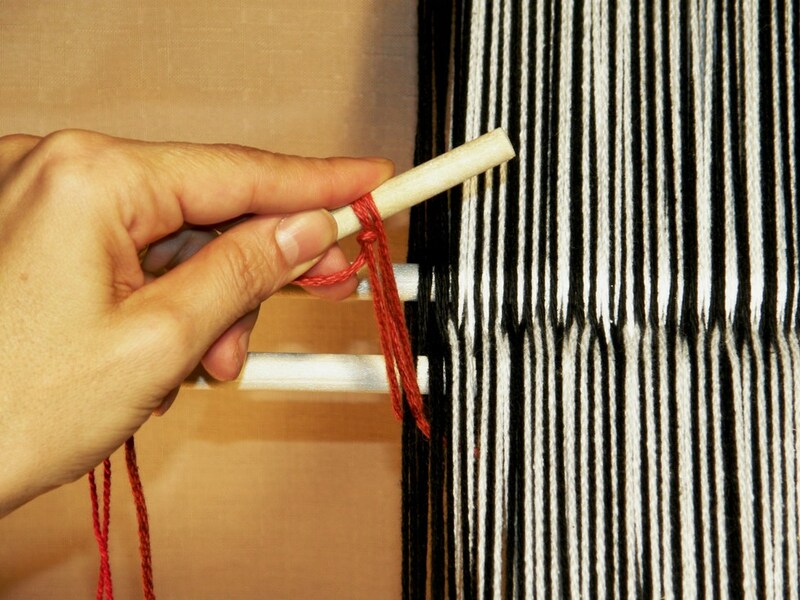 You could strum your fingers gently across the warp threads if some of them are sticking. Of course, some of the warp ends in heddle 4 will also be enclosed in heddles 1, 2 or 3 but that should not make any difference to anything. Once you have your sword within the shed, you should tip it on its side. If your heddles 1, 2 and 3 are pushed close together, the shed should clear straight through those three sets of heddles to the front of your loom where you can pick it up an another sword or ruler. You need your heddles to be at the very least the length of the width of your sword. When you want to raise heddle 2, for example, make sure that there is as much space as possible between it and heddles 1 and 3. You also want a decent amount of space between heddle 1 and the fell. Insert your sword into the shed and tip it on its side so that they threads can travel through heddle 1 to the fell where you can pick it up on another sword. When you tilt the sword on its side, do so sharply and strongly. You can even push down slightly as you do so. This will help open up a clean clear shed and ensure that you are not picking up rogue threads from the other heddles. Using multiple string heddles on a balanced weave is so much easier than using them on a warp-faced weave. You don’t have to deal with friction between threads and having them stick to each other. if you continue to have problems, you might consider that perhaps you got some threads crossed when you made the heddles in the first place, that is, you didn’t put them into heddles in the correct order. Any crossed warp threads will create obstructions and make it impossible for you to pass the open shed through the various sets of string heddles to the fell. I wish I could jump through the computer to be there to help. Thank you so much for your quick reply! Unfortunately, I couldn’t get it to work even with this advice. I’m pretty sure the problem is something I’m doing, but since I can’t teleport you here, I’ve given up (for now – I will conquer twill someday, probably on a different loom!) and rewarped for a simpler pattern. Thank you so much, though!! Thank you for the beautiful and well put together tutorial. The process has been bugging me and I just couldn’t figure it out 🙂 So thank you again for filling in the missing link and keeping me sane! You are very welcome! Thanks for your comment. Happy weaving. 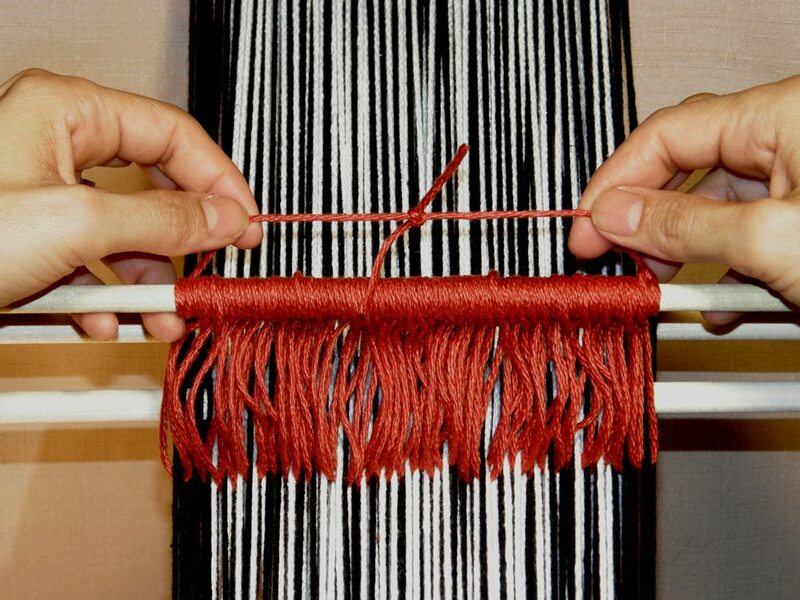 Laverne, this continuous string heddle is very easy compared to using individual heddles. Thanks for your excellent explanation! Great! I hope you find it useful.